Samayita Banerjee is an MPhil research scholar in History at the University of Delhi. She has done her BA Honours in History from Presidency College, Calcutta University and completed her MA in Ancient Indian History from the Department of History, Delhi University. Her research interests lie in the area of southern Bengal and themes of heritage conservation, archaeology and literary cultures. The majestic Hawa Mahal, or the Palace of Winds, is often the first visual that comes to mind when one thinks of the Rajasthan's capital of Jaipur. The ‘pink city’, as Jaipur is popularly known, presents a beautiful marriage of history, heritage and architectural splendour, with the rose-tinted sandstone Hawa Mahal standing tall among one of the most visited and unique monuments. However, not many know that the 300-plus jharokhas (portholes) that form the very memorable façade of the monument that attracts tens of thousands of tourists from around the world each year, is actually its back side. Moreover, even the front façade doesn’t serve as a direct entrance, and one has to enter from the side of the City Palace, of which it is a part. 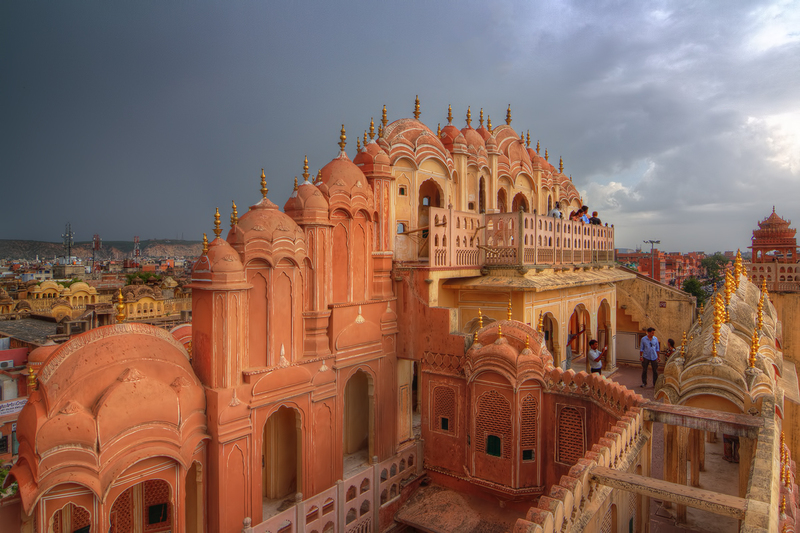 Located in Badi Chaupar (large square), in Jaipur’s Old Town, the impressive Hawa Mahal is highly regarded as an architectural marvel and has even been called ‘the standing vision of joyous poetry’ in an ode by I.K. Sharma, highly regarded as a pioneer of English poetry from Rajasthan. 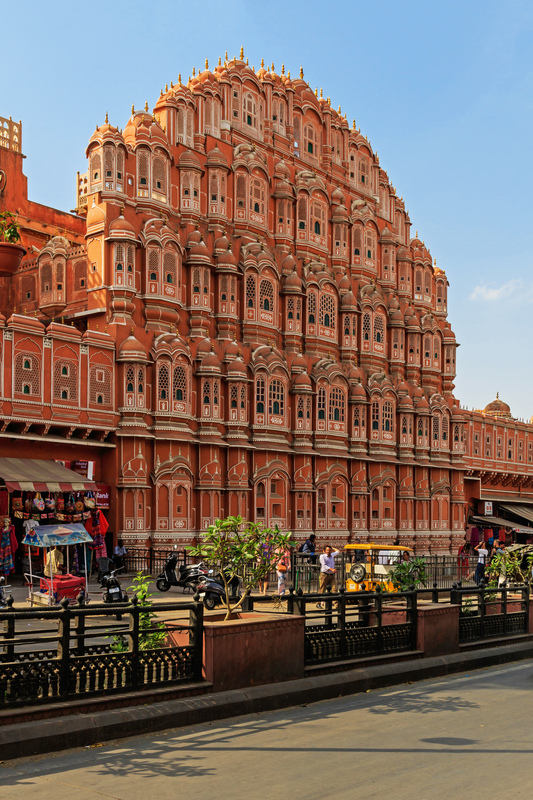 Borrowing lines from Sharma’s poem, the Hawa Mahal is indeed a vision over five storeys with its 365 latticed windows offering a splendid view of the city. The honeycomb structure is unique to this 18th-century building that was constructed as a viewing gallery for the women of the royal family of Maharaja Sawai Pratap Singh (r. 1764–1803), the grandson of Sawai Jai Singh II. The ornate portholes gave them a vantage point to observe the city life around without being seen themselves. Designed by Lal Chand Ustad in 1799, the inspiration for the monument is said to have come from the Khetri Mahal (also known as the Wind Palace) at Jhunjhunu, Rajasthan. Rising to a height of over 80 ft, the monument is broader at the base and tapers towards the top. The walls of the pavilion, however, are only 9-inches thick. An amalgamation of Islamic Mughal and Rajput style of architecture, the top part of the structure actually reflects Maharaja Pratap Singh’s devotion for Lord Krishna as it was built to resemble Krishna’s crown. The palace itself is said to be dedicated to Radha and Krishna, with there being a room in each floor dedicated to the god. Interestingly, the ornate exteriors of the Hawa Mahal are in contrast with the plain interiors, although there exist descriptions of the rooms having been decorated with different coloured marbles, relieved by inlaid panels and fountains in the courtyard. The stained glass windows also ensure a magnificent interplay of light during the day. While there are several reports doing the rounds that the Hawa Mahal was built without a foundation, this has been rubbished by the authorities. Another aspect of this multi-storeyed building that has often been reported is that all the floors are connected via ramps. While there is some truth to this, as many of the floors do have winding ramps to one side, there are stairs at the other end as well. The Hawa Mahal acted as the summer retreat for the royals at the time, primarily due to the ‘natural’ air conditioning effect caused by the scientific design of the latticed windows. The narrow, double funnel-like shape brought into place the Venturi effect—the phenomenon that occurs when a fluid or gas that is flowing through a pipe is forced through a narrow section, resulting in a pressure decrease and a velocity increase. This has made it an effective tool to beat the summer heat, thereby earning the monument its iconic name—Hawa Mahal. The outer face of each jharokha, apart from intricate jaalis (nets) and miniature windows, have carved grills, finials and miniature domes on sandstone, and in some cases, on wood. While Hawa Mahal doesn’t really feature in the popular list of haunted monuments in India, and there don’t seem to be any written records of any paranormal activities, local guides do occasionally mention the ‘presence of the Rani's past’. Once such account is during the Teej festival, which was celebrated with much fervour within the palace walls. Some guides talk about hearing the crinkling of anklets and the laughter of women in the windy corridors on the occasion even now. While these impressions could either be imaginative or even publicity gimmicks, there is no denying that Hawa Mahal is one of Jaipur’s, and India’s, crown jewels in architecture. Currently maintained by the archaeological department of the Government of Rajasthan, it has been restored with help from the Unit Trust of India. The exquisite red-and-white sandstone monument is an elegant example of the beauty and science of Jaipur’s monuments, and for tourists, it’s one of the best places to savour a bird’s eye view of the Pink City. The Hawa Mahal has 365 latticed windows, or jharokhas, at the rear of the monument, which is its most photographed façade. There is a small museum within the premises of the Hawal Mahal, which is a must-visit for tourists. The best time to visit the Hawa Mahal is said to be at sunrise, when the building and skyline are both lit up in the golden glow of the rising sun. Not many poems are written on monuments, which would make searching for Hawa Mahal, the poem by I.K. Sharma an interesting exercise. Entry to the Hawa Mahal is free on four days of the year—Rajasthan Diwas (30 March), World Heritage Day (18 April), International Museum Day (18 May) and World Tourism Day (27 September). This article was also published on Indian Express.